A steady increase in both demand and Rand value in the Boland property market in recent years has seen the area join the elite trophy home club, with sale prices in excess of R20 million now being realised for single erf, standard homes. 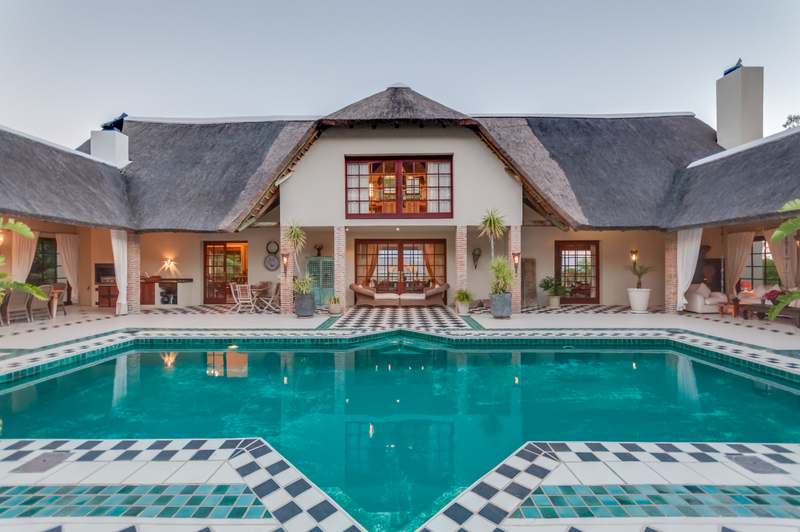 This large home on the secure Erinvale Golf Estate, designed with large-scale entertainment in mind, has several public rooms that spill out onto an extensive covered patio. The three-bedroom, four bathroom house also has two self-contained apartments for guests, both with access to the garden. The property is on the market for R21.95 million. Mrs Chris Cilliers, Winelands Principal of Lew Geffen Sotheby’s International Realty says that most of these sales have been on security estates, which reflects the current market trend for exclusive security estate and lifestyle living. Cilliers says that in the past year three sales have been concluded above R20m, all of them on secure estates in scattered across the Winelands. The most recent was a Lew Geffen Sotheby’s International Realty sales at Pearl Valley Golf Estate in Paarl for R22.5m. Cilliers says that there were 13 sales at De Zalze Golf Estate in 2013 and 2014 in excess of R10m, with most being between R13m and R18m; prices previously only realised for small-holding sales, not single dwellings on standard-sized erfs. With most Boland towns are situated no more than 30 minutes from Cape Town International Airport and 45 minutes from the Cape metropole, they offer all the lifestyle benefits of small town living yet all the amenities of the city are only a short drive away. Cilliers says that many families opting for this lifestyle have parents who commute to Cape Town daily so the convenience factor of being so close to the city allows them to raise their families in country surroundings, enjoying an outdoor lifestyle and safe environment where children can still play outdoors safely. The area boasts an excellent educational heritage and is home to many of South Africa’s top schools such as Paarl Boys and Paarl Girls High and Paarl Gymnasium along with Paul Roos and the University of Stellenbosch. The Boland is particularly popular with people looking to live away from the city because it lies in the heart of the beautiful Winelands, offering a small town pace and myriad activities for sports and outdoor enthusiasts, with most facilities being right on the doorstep. Cilliers says the value of real estate in the Boland in general is climbing steadily, but homes on security estates are currently the prime investment to realise good returns in the next five years.